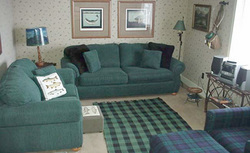 Fishing Cabin is a one bedroom, one bath cabin located in town and can accommodate four people. Montana Connections, Inc. is dedicated to providing the best vacation homes and customer service in Red Lodge. We have a wide selection of cabins, cottages, and condos available to rent by the day, week, or month. All our homes are fully furnished with full kitchens, linens, dishes, pots and pans, etc. Most have a washer and dryer, BBQ grill, TV, VCR and stereo. Some even have private hot tubs. Call today or visit our website for more information. Directions: Montana Connections is located at 108 1/2 South Broadway in Red Lodge. Highway 212 turns into Broadway, we are between 12th and 13th Street on the east side of the street.